CsgA is the monomer of curli, which is an important component of excellular matrix of Enterobacteriaceae. Curli fibers are involved in adhesion to surfaces, cell aggregation, and biofilm formation, they are also used for studies of amyloid fiber formation in human diseases, such as Alzheimer’s, Huntington’s, and prion diseases. In consideration of curli is an important component of excellular matrix and biofilms, confer diverse artificial functions to the biofilm matrix, such as nanoparticle biotemplating, substrate adhesion, covalent immobilization of proteins or a combination thereof.to the biofilm matrix.In our project, we modified csgA to construct a brand new enzyme fixation matrix or surface display platform, which works as expected and proved the great biological potential.Furthermore, the cell-surface display has many potential applications, including biodegradation,live vaccine development, peptide library screening, bioconversion using whole cell biocatalyst and bioadsorption. In short, csgA provides huge potentials for future igem communicity and we are so glad to see the future application! This year we made use of the design of cell-surface display and modified the csgA protein by fusing spytag to the N-terminal, making it a dorable platform to form enzyme complex and increasd the electrical conductivity because of the histag in the C-terminal. Therefore, we finally constructed our available platform for protein scaffolding, which has been proved more stronger to fix enzymes on electrodes. 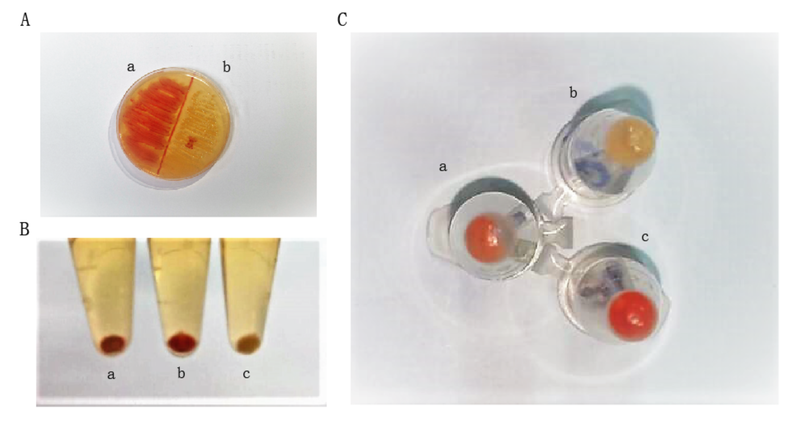 Cango Red(CR) dye plates and deletion assay shows success induction of over-expressing and the amploid protein characteristic.To see the results, please click here to change to part page. Barnhart, M.M. and M.R. Chapman, Curli Biogenesis and Function - Annual Review of Microbiology, 60(1):131. Amyloid Cellulose Enteric Biofilm Extracellular Matrix. Nguyen, P.Q., et al., Programmable biofilm-based materials from engineered curli nanofibres. Nature Communications, 2014. 5: p. 4945.